Maud Hart (Betsy Ray) grew up hearing the stories of the Civil War from her parents and from the Civil War veterans (Judge Hodges) who visited her school every Decoration Day. Come to Mankato (Deep Valley) on Saturday, Sept. 27th when Living History actors bring these stories to life in the beautiful, historic Glenwood Cemetery. Maud Hart Lovelace is buried along side many of these brave veterans. Following the walk will be a delicious chili or soup supper at the American Legion Post #11. 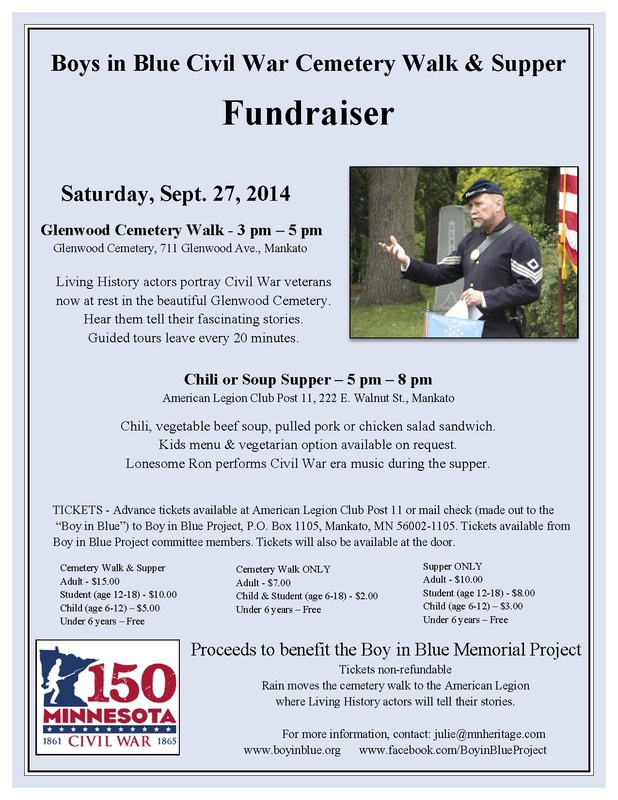 This event is a fundraiser for the Boy in Blue Civil War Memorial in Lincoln Park. The weather is supposed to be gorgeous! And the trees are starting to turn colors here in southern Minnesota. I hope some of you can make it to this event! Bring your cameras!